We're limbering up, putting on sparkly sweatbands and stretching our typing fingers because it's time for the Marathon episode of SCD. All 15 couples are hitting the dance floor tonight for your viewing pleasure, even if it does mean we're writing a scroll button-melting blog post tonight. Brace yourselves, we're in for the long haul. And no Bruce tonight! Tess seems to be wearing something nice too, it's a very odd week! I love these two, they're just having a ridiculously good time and somehow not making us not want to vomit along the way. The curse of the dreadful tango music seems to have returned this series, but actually after about 10 seconds I didn't really care. Again a great routine from Mr Grimsby, packed with content, I can forgive a few frantic moments. An unexpected one to watch, and not just to see if they're going to wee themselves with excitement. He who shalt always be known as Kevin from Grimsby. Oh I do so hope he doesn't mind. I am starting to like this pair very much and this dance was good, despite the music being as near to the mood of tango as Slipknot are to a Viennese Waltz. We have seen many a week two tango and many have left us traumatised, nay, even, begging to be thrown to the hounds of hell. This, not bad. Ones to watch, my friends, ones to watch. Strictly golf wear? I guess they've go to fill the time before he's voted off somehow. A Charleston on the other hand was not really the way to go, although, what latin would he really want to do? But then again, he hardly busted a gut! It's one thing to bring your day job into it when you're an Olympic gymnast, not when you're a golfer. Team Toniona. Which sounds like Italian foodstuff. And she clearly was enjoying dancing with the golf club at the beginning more than she enjoyed dancing with poor Tony. Let's face it, the older dude never has much chance anyway, but paired with someone who gives off the vibe of not giving a do-si-do about the entire thing? I'll eat my pyjamas if we see him dancing next week. Brace yourselves, Artem is in a velvet smoking jacket. These two look Oscar-worthy. Bit too much out of hold at the start but since they were so good when they got into hold I think I'll let that one pass. I thought she looked a bit nervous at the start, but that was quickly forgotten. Goosebumpingly good. We can't see the lack of heel lead with those swooping cameras but I remember Kelly Brook being told off for the same thing. You know, back in the day. Actually, back in that day, Artem would have been chastised for the gross lack of hold at the beginning of the routine. It really is a case of anything goes these days isn't it? Which does nark the old Strictly purist in me. But in terms of costume, music and performance, it was magic. Most efficient prop use ever. Let's do some lifts. Darn, he can't lift me off the floor. Excellent! Chef! Restaurant! CHAIR! Busted by Darcey though. I thought that was genius. Evil genius. Curse of the rubbish tango music part 2. The existentialist angst wind-up doll opening and closing bits were odd, was the slightly robotic tango the reason for it? That eternal question: why? I'm musing about this because I got bored halfway through, sorry guys. There's a fine line between a tango face and a crazed psychopath face. Patrick fell slightly towards the latter. What was the story? Patrick is a doll - a slightly warped version of Truly Scrumptious in Chitty Chitty Bang Bang - that comes alive, marches Anya around, then she becomes the doll at the end? I am so, so, so confused. Was it a wind up? Boom boom. Like Susanna, Deborah just seem to be having such a good time you can't help but like her. And as for that intro, I think that was what James was trying to do last week? It was a cha cha and well done to Robin for not making it all about him but a dance between the two of them. Technically a bit sloppy, but it's still early days and the woman has skill. I love seeing a cha cha so basic I recognise some of the steps from my less-than-a-year-of-ballroom-classes. She's trying. She's enjoying. Robin is lovely. I like Deborah. But that's all. I was going to say I'm not commenting on salsa until they show something that resembles salsa. Pasha however is one of the pros who does tend to choreograph something more akin to salsa than most. So the moves, yes, I've seen worse. But this was a tad apprehensive and ungainly - and the music was ridiculous. Rachel is not a performer though and that's a whole other level to break through, as well as the dance skill. She has the most potential for a journey. Pasha, get her to acting classes. The Matt Dawson effect. Do it. Well James actually bothered to choreograph a proper routine this week, well done. I knew she'd be better in hold with a slower routine, it's obvious. Fairly bog standard week one waltz, which could save her, or make her not interesting enough to stay in. This was like toast with no topping. It was there. It was tolerable. Janette is wearing a goth gypsy wedding loo roll cover, as you do. Is it supposed to be Strictly couture? Julien on the other hand is the world's campest WWF wrestler. I kind of enjoyed it as a spectacle, the song actually worked somehow, but the main thing I came away with was that Janette is an amazing tango dancer. If the point of it wasn't supposed to be Julien learning to dance then it might have been a success. Did they let Julien design the dress? Anton is doing a latin dance, prepare yourselves! 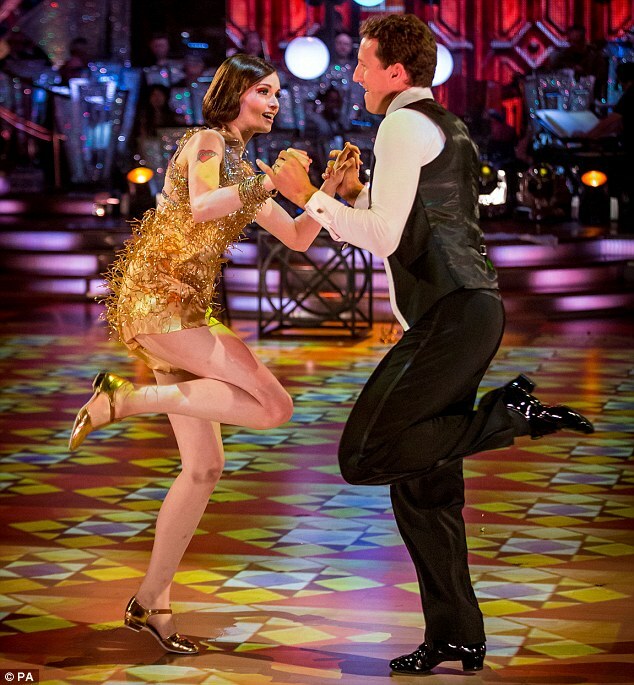 Actually, I think this was Anton's best latin dance in years, oh, are we supposed to be talking about Fiona? The woman has style and a great stage presence, it was going pretty well until she went wrong and then just looked endearingly manic. Biggest LOL of the night for Anton starting the dance sitting on a chair for a bit. Is Anton redeeming himself a little? Is he taking latin a little more seriously? I'm quite enjoying this partnership and I never in a besquillion years thought I'd be saying that. She did recover from the mistake. Not as flamboyantly as Pamela did that time. But it's hard to pick it up when you've gone wonky. My eyes, I think I'm going to get motion sickness when those outfits start moving...Was quite interested to see how this turned out after last week's surprisingly-good-despite-comedy-tango. Genius song choice, the band were loving it! This was a properly delirious dance, god knows what dance it was supposed to be. Iveta on the other hand was just doing some amazing dancing on the sides in an almost nonchalant fashion. There's timing, energy and musicality in there, make sure there's content too! Mibble. His timing is spot on though. Non-gurning Charleston alert! Genius choreography, perfect gymnastics, sparkly champagne! Twitter exploded, there was shrieking in the F household, proper SCD excitement. Sophie is looking spangle-tastic too, apart from the random pink eye makeup that makes her look like she's got an eye infection. Bring it on. Joyous. Brendan is now the King of Charleston. This dance really suited Sophie. I am looking forward to her quickstep. Well after the excitement of the Charleston this was a clanging change of gears. Ben did seem to have something on the ceiling that was fascinating him throughout, but he was obviously terrified. And towering over Kristina, they even piled her hair up on her head to try and make up the gap. He's not going anywhere for a few weeks, let's see if he can loosen up. Do they have Kristina's height down wrong? Two years in a row she's been given someone too tall. However, the difference isn't as big as it was with Colin Salmon. And Ben reminds me of Goughie. Which I like. The word I keep coming back to when describing that dance is 'functional'. She did all the steps and pretty well, but there was no personality in it. There were points between steps when she looked blank. I could see it was technically good, but I really wasn't feeling it. Thought she'd be a ballroom gal. This week was always going to be a downer on the top-of-the-leaderboard waltz. She needs to commit - yes COMMIT - to the moves. There were moments when she really got into it - eyes, teeth, flare. But much of it was kinda just walking around. Dance by numbers. She does have potential though, just a little more work needed on being out of Alijaz's arms. Ola's hair looks like a giant seashell, but she's in a spanglicious Ola Jordan ballroom dress so who cares. This was too good for someone who had only done it about three times or whatever. That's probably natural talent there, although I get the feeling he's more comfortable out of hold than in. Good ending to the longest of shows!